My name is Devin Harris and I am a Professor at UVA. My background is Civil Engineering and we are researching concepts related to quality of life within communities. 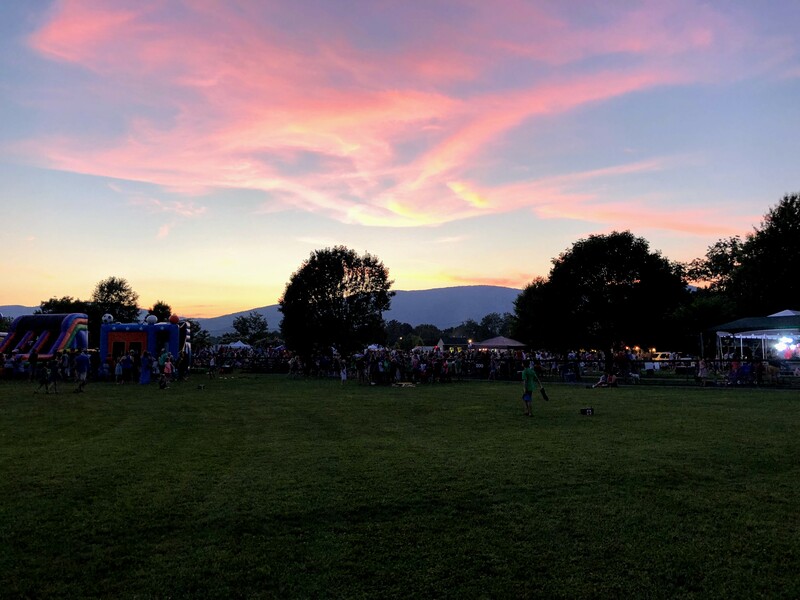 I have been part of the Crozet community for the past six years and thought this might be a great place to get some informal feedback on our work. I was reaching out to assess potential interest in our study that focuses on opportunities to understand and improve quality of live in neighborhoods and communities. 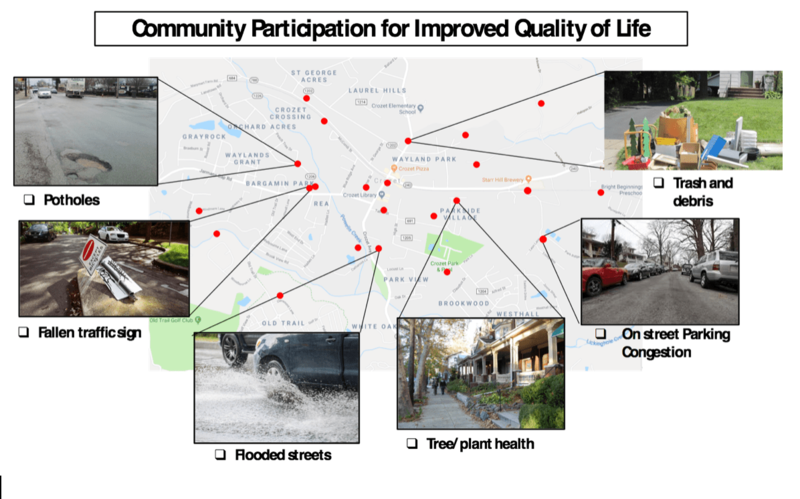 In brief, this study aims to use a crowd-sensing approach by encouraging community members to take and share data (specifically pictures and descriptions) of issues of concern in their neighborhood/community such as congested streets, sidewalks in disrepair, flooded streets, fallen traffic signs, potholes, etc. These data (primarily images) would then to be used to create models that will automatically detect the issue and report them to decision makers. Such models are expected to help decision makers and members of the community with necessary information for solving the issues. The schematically demonstrates this idea (Note: This is only illustrative of the concept and not real data). At this point we are not soliciting any participation, but I would like to assess potential interest. If you would so kind as to fill out the attached survey about your potential interest in such an idea, I would really appreciate your input. We are not collecting any information about those participating in the survey, only gathering some basic numbers on who might be interested and how they might be willing participate. The survey is four simple questions and will probably not take more than 30 seconds to complete. Thank you in advance for participating in this effort. There’s a great discussion on Twitter about this storm. Might as well get prepared, folks. Pretty good emergency supply list at Wirecutter. The 9th annual Crozet Trails Crew 5K Trail Race and Kids 400-meter Fun Run is only one month away! Come out on Saturday, October 6 to run, walk, or jog through woods, grassy fields, along streams, and over bridges (more info below). Many are already working behind the scenes planning the race route, painting bridges, collecting prizes, etc. Workday on Saturday, Sept. 29 to prepare the trail for the race. Meet at 9 am at the trail entrance off Park Ridge Drive. Drive down Park Ridge through Western Ridge into Foothill Crossing, and look for the trail entrance on the left. Help at the race on 10/6 by setting up, staffing registration, giving out prizes, and cleaning up after the race. Sign up to volunteer here, and thank you! Register to run/jog/walk the race here. The Kids Fun Run is at 8 am, with the adult race beginning at 8:30 and award ceremony at 9:30 with lots of prizes, including bridge naming rights to the male and female first place finishers! Registration and packet pick up will be Friday evening 10/5 from 6 to 8 pm in front of Crozet Library, as well as Saturday morning 7-8 am at Crozet Park. Fee is $20 online in advance or $25 in person. Registration includes a race tee shirt plus admission to the Crozet Arts and Crafts Festival immediately following. The Crozet Trails Crew helps our parent non-profit, the Crozet Park, by staffing the wine and beer tent at the Arts for and Crafts Festival. Sign up for a shift as bartender here. Help get the word out by posting the attached flyer at your workplace, church, or school. And that’s not all! A team from Albemarle County Parks & Recreation has begun to make major improvements to the muddy and rutted trail just outside the dog park at Crozet Park. We are looking forward to a smoother, drier trail in that section. Thanks to all who helped them! Our monthly meeting has a NEW date (third Thursday) and location this month! It will be Thursday, Sept. 20 from 6:30 – 8 pm at Crozet Pizza. Hope to see you there for final race planning! via email. See PDF for more information. 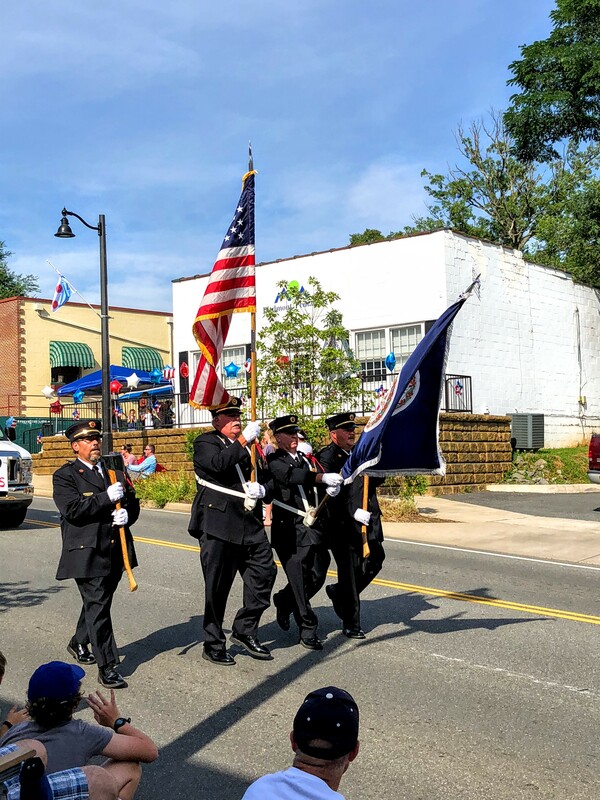 After our first ever Crozet Volunteer Fire Department Golf Classic, an event that exceeded our expectations, we are back to bring you another exciting day of community fun at the base of the beautiful Blue Ridge Mountains. Last year, with your help, we were able to raise $29,028 and contribute $20,407 towards a 2018 Polaris Ranger 900XP to better serve our community. On Thursday, September 20, 2018, we will be hosting the second annual Crozet Volunteer Fire Department Golf Classic at the Old Trail Golf Club in Crozet, Virginia. To ensure the tournament goes off without missing a stroke, it is vital that we have the support of those we protect day in and day out. With that said, we are actively planning 2018’s tournament and are looking to grow and further increase our community footprint with help from sponsors like you. Thank you to all of the volunteers who worked tirelessly to pull off one of the best days in Crozet every year. For the parade to the music, food trucks, parking, traffic, fireworks and everything else, thank you.